Before learning about Addison disease causes, you should know about the disease itself. 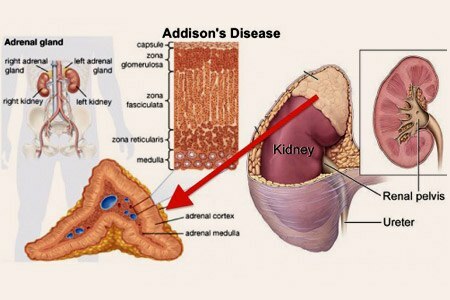 Do you know why this adrenal disorder is called Addison's disease? The answer is very simple: It is named after a great physician of the 19th century, Thomas Addison. He was also a renowned English scientist. He is acknowledged as among the "great men" of the Guy's Hospital in London, England. It is shocking to know that the cause of death of this highly intellectual and celebrated man was suicide. The disease was first described in 1849 by Addison. For about a century, after its description, there wasn't available any effective treatment. It was regarded as invariably fatal. However, in 1950s, the therapy of corticosteroid replacement came to the rescue of humanity. Now the condition is highly treatable. The adrenal glands play the role of endocrine secretions in the body. They synthesize and release certain vital hormones. These hormones carry out various assigned tasks in the body. They hormones are collectively termed as corticosteroids, and include cortisone, dexamethasone and cortisol. The Addison disease causes lead to the onset of the disease. The disorder destroys the adrenal glands. So, they are unable to produce the steroid hormones. It results in symptoms of the disease. Low level production of the steroid hormones characterizes Addison’s disease. So, you can also call it with various other related names, such as, hypoadrenalism, hypocortisomalism, or the chronic or severe adrenal insufficiency. It is more precisely termed as chronic primary adrenocortical insufficiency. So you can distinguish it from a number of other related diseases. The secondary and tertiary adrenal insufficiency and secondary adrenal failure are some other conditions of the adrenal cortex. If you do not find out the Addison disease causes and treat it timely, it may lead to the aggravation of the situation. In case of Addisonian crisis, the patient may even go to coma and suffer from very low blood pressure. The patient becomes lethargic and experiences prolonged periods of excessive fatigue and weakness. There occurs decrease in appetite and you start losing you weight. As the situation aggravates, nausea, vomiting and abdominal pain may become frequent. Either constipation or diarrhea may start. The latter plays havoc to the health of the victim. If you do not treat diarrhea timely, the patient may even die due to extreme dehydration, weakness and low blood pressure. There occur changes in the personality and behavior of the patients. They may experience irritability and a state of restlessness. The victim experiences enhancement in the senses of hearing, taste and smell. There is an important modification in the physical appearance of the patient. It results from the higher level of pigmentation in the skin and mucous membranes. However, such a condition has no relation with the disorder of secondary adrenal insufficiency. The increased pigmentation may result in the appearance of dark freckles. Uneven patches of darkened skin and persistent tanning appear after an exposure to the sunrays. One of the primary Addison disease causes is the autoimmune disorder. In this case, while fighting against the diseases, your immune system attacks the healthy tissues of the body, such as adrenal glands. If you have a family history of the hypothyroidism or some other autoimmune disorders, you might be having a very high risk of Addison’s disease. Heredity is an important factor among Addison disease causes. This ailment has an obvious link with the deficiency of steroid hormone. But the long-term treatment of any other illness with steroids may lead to the onset of Addison's disease. In this case, the excess steroids cause the degeneration of the adrenal cortex. So, for the recovery of the adrenal function, you need to stop the steroid treatment for some months. For the treatment of some other disease, you might be going through the anticoagulant therapy and taking medications, like heparin or warfarin. In this case, you are very likely to suffer from the adrenal hemorrhage and the destruction of adrenal cortex. The complication of certain infections can also be among the Addison disease causes. For example, histoplasmosis, tuberculosis and cytomegalovirus may also lead to the onset of chronic primary adrenocortical insufficiency. Metastatic cancer and some other related disorders may lead to the destruction of the adrenal tissue. The malfunctioning of the pituitary gland is also included in the list of Addison disease causes. It includes pituitary tumor, surgical removal or radiation of the pituitary. As the disease has a link with the family history, the healthcare provider needs to trace the medical background of the family. It may be one of the Addison disease causes. Physical evaluation is also of great help. In this way, the physician can easily observe if there are higher levels of pigmentation in the body skin and the mucous membrane. In order to measure the hormone levels, in the body, the blood and urine tests are necessary. Use of Corticosteroids: An easy and immediate method for the treatment of this ailment is the use of corticosteroids. They replace the deficient steroid hormones in the body, such as prednisone, cortisol and dexamethasone, etc. Such medications promote the secretion of gastric juice in the stomach. So the patients need to take these drugs with milk, meals or antacids. In this way, the access gastric acid secretions will be useful for the digestion of food. They will not be harming the wall of your stomach. Intake of Ludrocortisone: The disease causes imbalance of the salts and minerals in the body. Physicians prescribe ludrocortisone (a mineralocorticoid). So the balance of salts and minerals could be controlled. This, in turn, prevents the symptoms of dehydration and hypotension (usually low blood pressure). Increasing the Dose of Corticosteroids: The patient may be passing through stressful times, such as surgical operations, severe infections, dental extractions and gastrointestinal ailments. So, there is need to increase the dose of corticosteroids. The victims suffering from adrenal crisis need emergency medical treatment. The emergency treatments include intravenous injection of fluids and hydrocortisone. If you delay the emergency treatment, the life of victim would be at risk. 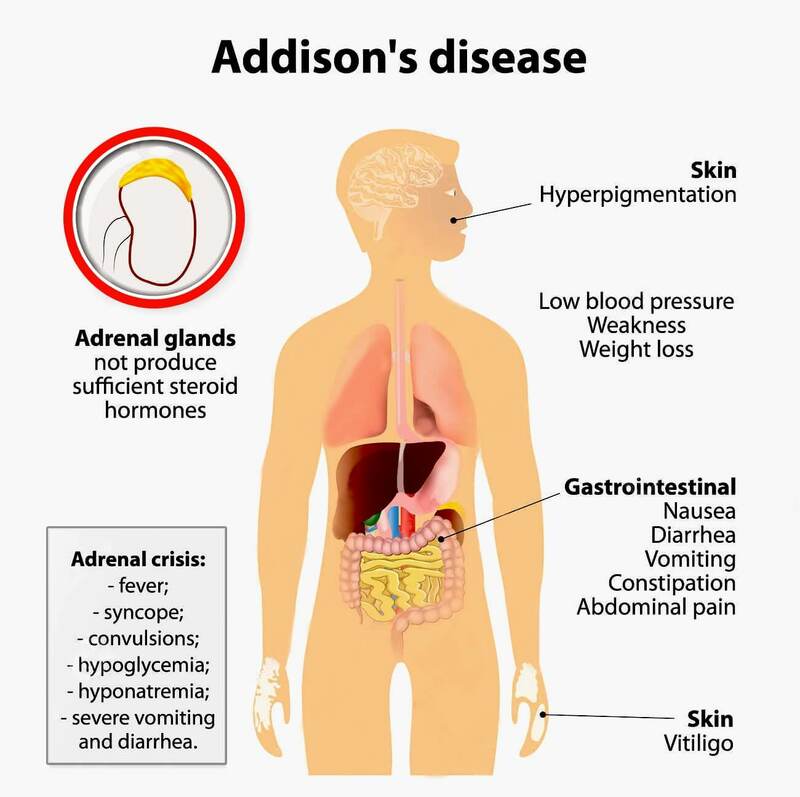 The patients of Addison's disease should carry or wear medical alerts or identification tags round the clock. It will be of great help for the physician.